A recent project reported in the latest (28 Mar 2018) issue of ACS Nano journal demonstrates how they can also be used to convey and store charge. The researchers behind this study have 'spun' the nanotubes into something like yarn. A length of this can be fitted with electrodes in order to act like a battery. Furthermore, since wool is a relatively thin fibre, it can be knitted into an entire surface of the charge-storing material. The scientists who invented this also claim that their yarn can be cut into two pieces and still function as a battery. Now, a battery that acts like a woolly sweater may not inspire confidence. However, much of the machine-woven fabrics also come in knitted forms. In these cases, the knit is so tight that the resulting textile is extremely congruent and holds together well. This is the principle behind the use of the 'yarn-battery' so far. As a part of the research, the team also showed how this yarn could be combined with LEDs and incorporated into a length of fabric. The result was demonstrated as a glowing, smiling panda bear with bamboo. If the yarn is strong enough to be knitted, it can be considered ready to use in electronics. The researchers also hope it will help make up the new generation of wearables, as done in the past with "power" clothing. These gadgets may see more uptake if they are ergonomic and skin-fitting. Innovations such as yarn batteries could revolutionise health tracking and other personal care-related applications. 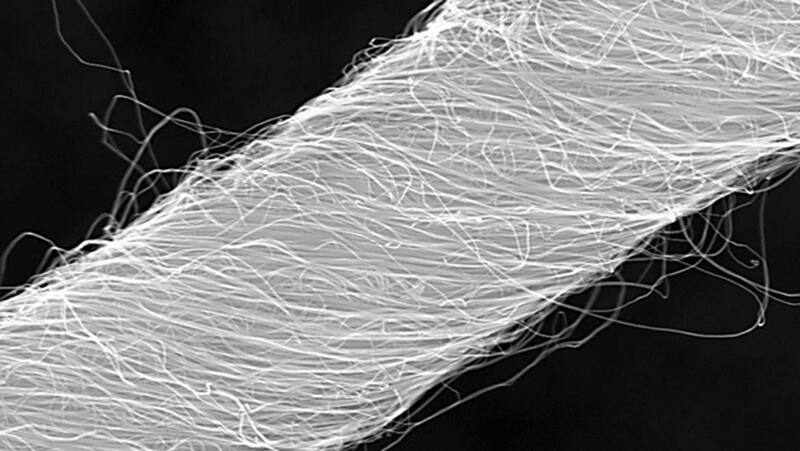 The carbon yarn has been investigated, before, for its potential use as a battery component. It has been used as a 1D fibre in conjunction with flexible zinc-manganese oxide compounds. However, the resulting products, although user-friendly, were unable to maintain their original maximum charge. In addition, some versions were not rechargeable. Enter the new yarn-batteries: rechargeable and waterproof! The researchers designed this unique battery by composing carbon nanotubes into a single strand, accomplished by twisting multiple nanotubes into a double-helix formation. One end of the strand was coated in zinc and the other in magnesium oxide. So, the yarn-battery had its cathode and anode. Following this, the researchers coated the material in the form of a polyacrylamide, which acted as an electrode. The setup was then encased in silicon for protection. The group observed that the combination of the double-helix twist and the electrolyte resulted in considerable electroconductive properties. The battery was reported to possess a volumetric energy density of 53.8 mWh/cm3 and a specific capacity of 302.1 mAh/g. After 500 charge cycles, it was noted that the yarn-battery retained over 98% of its capacity. The rechargeable cell was also associated with the ability to take considerable (300%) strain, that indicated it was stretchy, a desirable property for wearables. Additionally, the battery reportedly retained over 96% of its charge, even after being submerged in water for 12 hours. It could also be cut down from its original length (approximately 1 metre) and be used to power small electronics like watches and LEDs. The authors of the ACS Nano paper completed their work at the Shenzhen Research Institute, the City University of Hong Kong, Shenzhen University and Tsinghua University. The innovative project, led by Chunyi Zhi of the Department of Materials Science and Engineering at City University, appears to offer a novel option for wearable technology power in the future. This new nanocarbon-based yarn is believed to withstand being woven and integrated into electronics that may have to endure contact with water and consistent daily strain. It is also apparent that they may be able to produce static displays with appreciable brightness and contrast. The new battery type is an interesting alternative in a world of ever-evolving prototypes that come in two-dimensional expanses for use in layers or flattened rectangles. Hopefully, this 'yarn-battery' will see the light of implementation and development. Ultimately, it will be interesting to see which battery type will power wearable devices of the future. Li H, Liu Z, Liang G, Huang Y, Huang Y, Zhu M, et al. Waterproof and Tailorable Elastic Rechargeable Yarn Zinc Ion Batteries by a Cross-Linked Polyacrylamide Electrolyte. ACS Nano. 2018.